Red and White Fleet just launched San Francisco’s only “City Lights Cruise,” starting November 8, 2010. 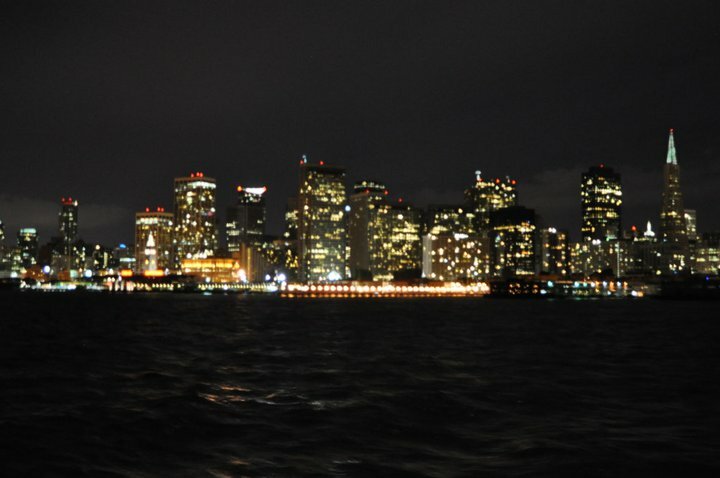 On this casual two-hour cruise, passengers will enjoy views of the city’s spectacular nightscape, live guitar entertainment, hearty appetizers from the buffet and a hot or cold beverage from the bar. Nestled into the warm and cozy atmosphere of Red and White Fleet’s historic ferry boats, the cruise will pass along the dramatically lit skyline of San Francisco with its modern skyscrapers and historic landmarks, pass the infamous island of Alcatraz and cruise under the impressive San Francisco Bay Bridge and the legendary Golden Gate Bridge. The generous buffet includes a variety of hearty appetizers, such as sandwiches, salads, fruit and dessert. To keep guests warm and comfortable on those stary winter nights, Red and White Fleet’s vessels feature heated indoor spaces with large viewing windows and upholstered seating as well as outdoor viewing decks. A full cash bar with drinks and snacks is available as well. Advance bookings are recommended as this event will sell out on some evenings. A full bar with drinks, snacks and merchandise (including logo wear) are available onboard. Prices are $54 for adults (18+) and $36 for youth (ages 5-17). Children under five are free. Departures are on Fridays and Saturdays at 5:30 p.m. from, November 8, 2010 to March 30, 2011. The route: From Pier 43½, along the San Francisco waterfront (Fort Mason, Marina, Presidio) to/from the Golden Gate Bridge, loop around Alcatraz, west of Treasure Island, under the Bay Bridge and past AT&T Park, the Ferry Building, Pier 39, back to Pier 43½.